One year ago (at Christmas) my mother-in-law passed away. Yeah, that's not how I thought this post was going to start either, but the truth is that horrible period in our life has completely altered our path. In October 2016, she was having Sunday lunch with us and we were planning Christmas and trips for 2017. By the end of December, she was in a coma which she never recovered from. Watching that lovely woman fade before our eyes, listening to her talk about the things she'd done and the regrets she had, knocked us around the head. Hard. We've all said it a million times but this really brought it home to us- life is too fricking short. Want to see what we did in 2018? – Visited a village with no roads. By, er, road. A year ago there was no Wandering Bird. We didn't own Triumph Scramblers, or a motorhome, or have any followers on social media. We hadn't even considered changing our lifestyle, slowing down to smell the roses and going for adventures around the world. We were too busy working & earning for all of that. But after this tragedy, we sat down and really looked at our lives. Were we happy? Were we fulfilled? Did we look forward to the next year? It was surprising and a little terrifying to realise we had fallen prey to the ‘rat race' and most of our decisions were governed by money and work. Very few of our choices were about fun and living life to the full. Of course, this started a whole new problem. Mr WB had his nice shiny new bike, but I hated riding my old Suzuki. As in- I'd ridden it twice in 3 years and once was to take it for its MOT! Our daughter, Jade, was now old enough to join our adventures and she would be riding pillion behind Mr WB- which meant there was no space left for me. I either had to (re)learn to ride or get left behind whilst they rode off on adventures. That was NOT happening! Having sat on the Scrambler, I instantly preferred it to my Suzuki. It was bigger, meaner and slower- I was much less likely to kill myself on one of these. It felt rugged- a bike which could take you anywhere and deal with whatever terrain you were crazy/ stupid enough to throw at it. So in January 2017 we went back online and found another Scrambler- this time in a beautiful matt blue. It was a couple of years older- I didn't want a shiny new one in case I dropped it! But it still had all the beautiful chrome work which I love. However, it's one thing buying a pretty bike- it's quite another learning to ride it. I couldn't even remember how to change gear! In April 2017, we put the motorbikes on a trailer and towed them behind our car down to Bordeaux, France, where we hired a gite. Hiring the gite was not an easy task, as we tried to find somewhere where we weren't going to be hated for having motorbikes- especially as these aren't the quietest of engines. As it turns out, the French are a lot more tolerant of bikers than the British- but we didn't know this. Finding somewhere around Bordeaux which was biker friendly and available over Easter holidays was not easy. We found somewhere eventually and had a brilliant time. Even better- it was during that trip we first saw a motorhome pulling a trailer with a bike on it. Why had we never thought of that??!! It was like a little lightbulb went off in our heads! A Motorhome & motorbikes- perfection! We'd often discussed getting a motorhome or a caravan. Mr WB had grown up caravanning with his parents on a weekend. I'd never really spent any time in them at all and I'd never been in a motorhome except for the posh ones in a showroom. Because we had the boat, we thought we'd never really use one. But now that we had bikes and a trailer, it was easy to see the advantages of owning a motorhome (not a caravan- can't tow a van AND a trailer!) It seemed perfect for us- especially when we like to spend only a day or two in one place and then move on somewhere new. So in May 2017, we started looking at vans. We had no idea what we wanted- or what layout would suit us a family. We debated a cool VW van, but with 3 of us there just isn't the space we need. We debated stealth vans- but space and no bathroom was again an issue. I wanted a dinette area, Mr WB wanted an end lounge. I didn't want to make up a bed (or two!) every day, he wanted something with large water and waste tanks so we would be able to wild camp for longer. We looked at loads of different styles- and eventually found ‘Little Ship', a McLouis Tandy 6 berth motorhome with an overcab bed, a dinette and fixed bunk beds at the back which were double sized! As soon as we walked in, the van had such a lovely feel to it. It wasn't perfect, but it was within our budget and it was in pretty good condition. We bought it there and then. Little Ship- so named because we keep referring to her as a boat! Over the summer holidays, we only had three weeks we could take off work, in two sections of 10 days each. The whole of Europe was open to us- where would we go? Firstly we decided to explore Scotland & Orkney in July. The trip to the Italian lakes was amazing! I loved Lake Maggiore and there were so many things to do in Lake Como. That trip unexpectedly took a northerly turn through the Swiss Alps. At this point, I'd started this little blog and was enjoying keeping you all up to speed with our travels- although it's a lot harder work blogging than I thought it would be!! I'm still miles behind sorry- I'll work hard on it over the winter. The Swiss Alps- and seeing the Milky Way. That was just incredible. Watching the Milky Way in the Swiss Alps- this night was life-changing for us! By the end of the summer, we'd put 10,000 miles on Little Ship and loved every minute of it. We all slept better in the van, we got out and did things as a family, we explored new places on the bikes and we spent less money. We didn't eat junk food as often and we NEVER watched TV. Not once. We played games and sang songs and were silly together. It was magical and I never, ever wanted to come home. But summer ended, as summers do, and work was demanding our return. Jade got EPIC grades from our time homeschooling and was accepted into the college she wanted to go to. We are ridiculously proud of her and all the effort we put in this year. But her being at college means we are a lot less free to go off for long periods- we have to stick to the school holidays for another couple of years. Still, we continued to use the van as much as possible. A particular favourite was wild camping next to Stonehenge and watching the more incredible sunrise. Click the video below. However, one thing we learnt when exploring Europe was that having a motorhome which was 3.2 high turned us into a truck (Cat 4) on the toll roads- of which there are many! This made the toll roads pretty expensive- almost three times the cost of a car. We also had nowhere in the van we could spread out- the only seating area was the small dinette table or our bed. Poor Jade couldn't even sit up in her over-cab bed. Having proven the theory of vanlife as a family, we decided to upgrade Little Ship. We started with a list of NEEDs, WANTs and WOULD LIKEs. We still needed two sleeping areas which are far apart, a dinette, lower than 3.1m high with decent storage and water carrying potential; we wanted an end lounge, a decent kitchen and a low profile; we would like a European door (ie- door on the right-hand side, which works best in Europe.). We also wanted something we would still go and drive down a muddy road full of potholes- not something so new and expensive we would be scared to scratch the paintwork. We searched for ages, slowly working through our options and found one at a motorhome show which we loved- but when we went back for a second look it had already been sold. I was gutted- but that same night I found Little Ship 2 on the internet which we liked even better. Some things are just meant to be! Want to see a video of Little Ship 2?? Here you go! Little Ship 2 is nearly perfect for us. She has a drop down bed, low profile, a SUNROOF, end lounge, decent kitchen, a dinette and more light than we have in our boat. The downsides were a tiny bathroom, less storage than was ideal and the door on the wrong side. Still, once again, as soon as we went to see her, she just felt like home. Within a week, we'd set off to go to Norfolk- only to end up in Cornwall. We wild camped for most of the trip and the van is utterly brilliant. Talking of which, another MASSIVE change for this year is I have now handed in my notice at work. How's that for terrifying?!?! But we know we can downsize even more in order to accommodate the loss of my wage- and the extra freedom it will give us is exciting. I'm basically trading money for more time with my family. We now have 7 weeks over the summer to travel- as well as all the other holidays throughout the year and weekends away. We are so excited about the possibilities in 2018, whatever they might be. It's weird that within 12 months we have set up a new business blogging, got nearly 10,000 followers on social media, started a YouTube channel with stories of our adventures and totally changed our lifestyle. We are going to have less money in 2018, but I get the feeling we're going to be a lot happier. Favourite photo: Probably the one above of the first time I've ever seen the Milky Way. It was jaw-dropping. 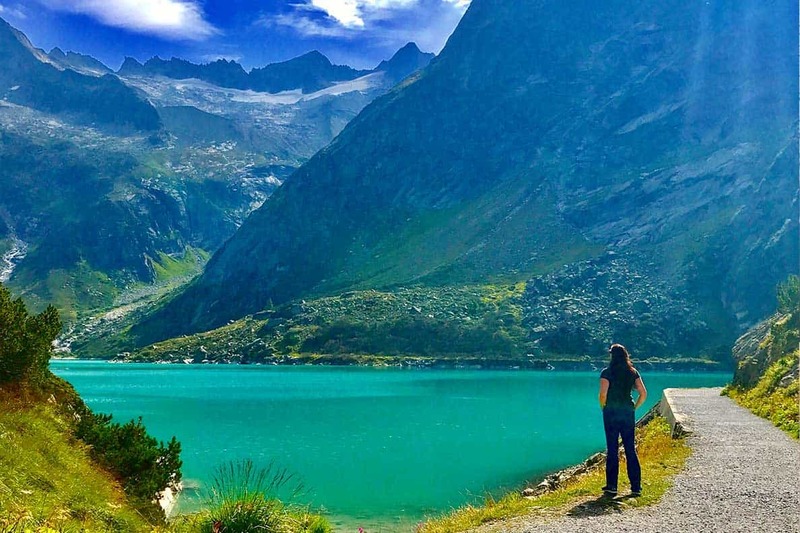 Or the one in the header for this post, by that incredible Swiss lake! Funniest moment: Too many to choose from- we spent most of the year in the van laughing together. But occasionally Cards against Humanity makes me unable to breathe for laughing too hard. Scariest moment: Going down a mountain in Switzerland without any brakes! That was pretty terrifying! Sum up 2017 in one sentence: This is the year we got our mojo back. We listened to our instincts and led with our hearts. We took back control and are working hard to do what we WANT to do, rather than living a life we don't really enjoy. How about you? How has your life changed in 2017? Let me know below- I'd love to hear from you. Don't forget, sharing is caring. Feel free to share this post on Social Media or Pin it on Pinterest! Your actions really do make a difference in letting others know the post is worth reading. Thank you. This is a very inspiring story! I compltely understand your fear of quitting your job and starting focusing on your blog, but it seems you’ve been doing great so far. I started my blog a year ago and, although I still struggle a bit with my social media numbers I keep positive. The best of lucks for 2018! Thanks so much for your lovely words Dann. It’s been a big decision but hopefully will prove the right one for us! Hope you have a wonderful 2018 as well. It’s certainly been an interesting year, that’s for sure! I hope 2018 brings you everything you wish for. Best of luck! Leaving my job is both exciting and terrifying! Pop back in February to see how I’m feeling on the last day!! Good luck for your 2018 too! What an amazing story! It’s always inspiring to hear stories of hardships and life changing decisions. Life is too short to just fall into routine. Look forward to following more of your travels! Thanks for your comment Kristin. Life really is too short- it’s something we remind ourselves of every day to try and make the most of each one. There will hopefully be lots more travelling next year! Wow. Thank you so much for the honesty in this post. I became a nomad about 3 years ago, in response to losing my mother. She also was fine one minute, not the next, and went very fast. So I relate very strongly to this post. I am so sorry for your loss, and for your husband’s. At least you have each other. I was still a wreck at the first year mark. Traveling is healing in so many wonderful and unexpected ways. I occasionally write about traveling with grief in my blog too. I was still a wreck at 1 yr mark, but I kept on traveling and kept healing. Grief doesn’t go away, but it get’s better and you learn to live with it and be normal again. Anyway, I would really love to connect with the two of you at some point and maybe we could do a collab about the healing powers of travel for someone grieving? Please contact me if you are interested. And if you want to read about my journey, check out my blog – I have a section called “A personal Journey” where you can find some related posts. Also – the Swiss Alps were one of the first places I went! Stunning. Love your blog. Good luck with your adventure. We started ours in 2015 and moved back into bricks and mortar in February,only to sell and get back on the road. We started a blog but we lost track with so many things going on and found it difficult to catch up. You will find the full time life just out of this world. After 40 years of full time work it takes some getting used to. Looking forward to your updates it may inspire me to start ours back up. Awesome! Thank you so much for your support and the link- I’ll be sure to check that out! We’re leaving in a few weeks, so if you’d like to follow along in real time, be sure to find us on Facebook or Instagram. 🙂 Maybe see you out on the road somewhere. I recently lost my dad which has had such a profound affect on me that I have handed my notice in at work and am planning to sell my house and live in a motorhome full-time – just me, my dog and my two grown up sons when they are on holiday from uni. Have you got any tips for me? How did you convince those around you that you hadn’t taken leave of your senses?